Eating disorders are the deadliest mental illness. Per the National Institute on Mental Health, they have the highest mortality rate of all psychiatric illnesses. 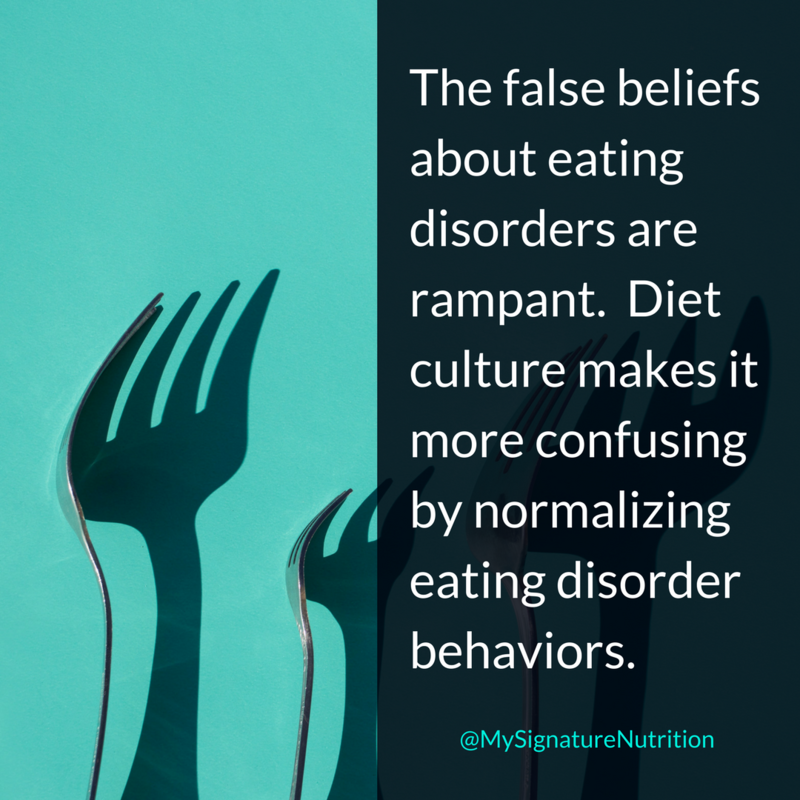 Sadly, the false beliefs about eating disorders are rampant and diet culture makes it more confusing by normalizing eating disorder behaviors. 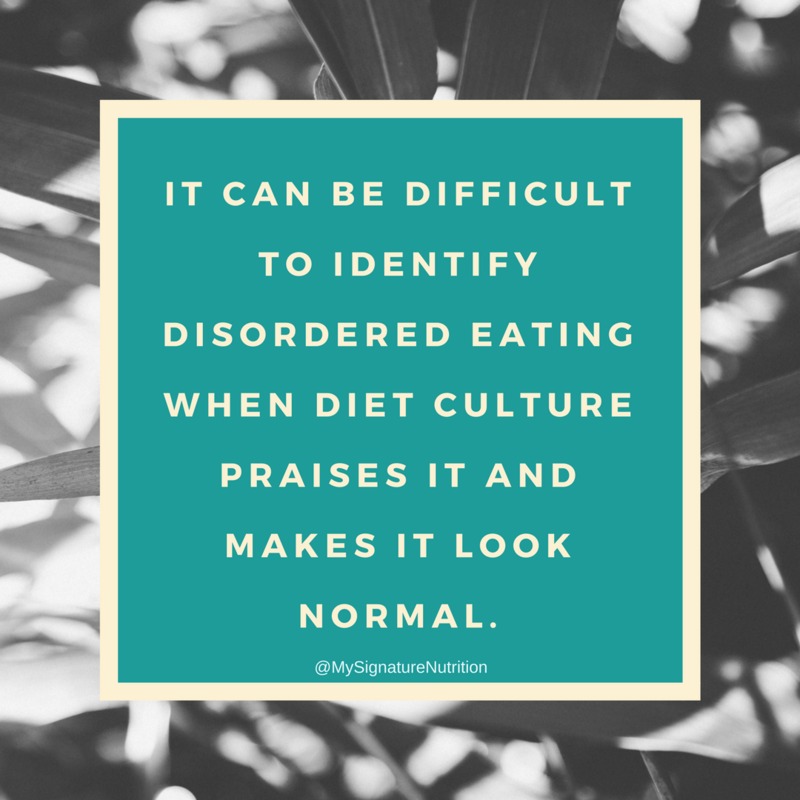 You could even go as far as calling diet culture eating disorder culture. When eating disorder behaviors are normalized it means that people end up suffering for years because they have no idea what an eating disorder behavior is- it’s just something they (and our culture) see as normal. This is a totally logical question- how do you recognize if you have an eating disorder when everything around you affirms disordered eating??? I’ve attempted to outline some signs to look for- really behaviors or thought patterns that could indicate and eating disorder or disordered eating. This list is not designed to substitute for a more thorough assessment from an experienced clinician that specializes in the treatment of eating disorders. This list is a larger list based off a checklist that I created with Celeste Smith, LMFT-A a therapist that I office share with. On our checklist we say that two or more checks suggest disordered eating and need for a more thorough assessment with a trained professional that specializes in the treatment of eating disorders. Please keep that in mind as you read through this list. It’s difficult to tell if it’s something more when you look around and it seems like everyone is affirming what you’re doing. Just because everyone does something doesn’t make it right. Keep in mind the ability to detect disordered eating at its early stages and seek appropriate care could prevent years of suffering, save lives, and increase a person’s chances of recovery. Weight loss, weight gain, frequent weight fluctuations, and in adolescents, failure to gain weight <– notice it can be at any weight and move in any direction- or even not change! An eating disorder isn’t weight dependent! 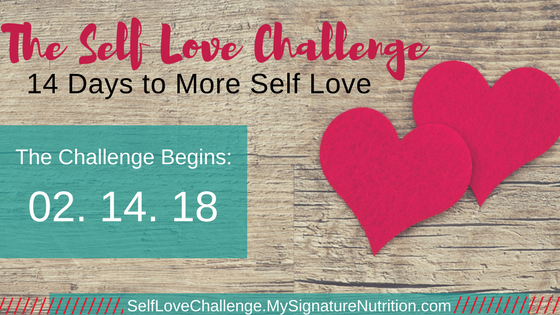 Basing self esteem and self worth on body weight, shape, or size. Unable to miss a day. I also have an even more thorough list of signs/symptoms that you can check out here. This list sounds like me. What do I do? If you identify with multiple signs, symptoms or behaviors on this list, (remember at the beginning I said two or more) please reach out for support from a trained eating disorder clinician. Lots of providers list that they work with eating disorders, please find a specialist. Eating disorders are a specialty area and require specialized training to help you truly heal your relationship with food and body. What Should I do if I’m concerned about a friend or loved one? If items on this list sound like a friend or a loved one, talk to your friend/loved one and reach out for support from a trained eating disorder clinician. Lots of providers list that they work with eating disorders, please find a specialist. Eating disorders are a specialty area and require specialized training to help your loved one get appropriate care. But what should I say to someone if I think they’re struggling with an eating disorder? I, and many of my clients, have found it helpful for people to say “I’m really worried about you. Are you okay?” Focus on using “I” statements. “I notice you never eat any of the things that you love anymore.” Or something along the lines of “I’m worried about how guilty you always seem to feel after eating.” Whatever it is that you’re noticing with your loved one that concerns you. Expect that your loved one will probably be defensive or brush off the concern. This is pretty normal. Let them know that you love them and that you’ll be there for them if they ever need support or want to talk. Encourage your loved one to speak with a professional. “I know you said that it’s not a problem, but I’m feeling really worried. Let’s schedule an appointment with a professional and if it’s nothing we don’t have to go back.” The professional could be any member of the treatment team- a therapist, dietitian, or doctor. If they’re overly focused on food or weight sometimes it’s easier to start with an eating disorder dietitian. Wherever you take them, it’s extremely important that you see an eating disorder specialist. Here is a link to questions to ask to find out of your provider specializes in the treatment of eating disorders. Taking your loved one to a provider who doesn’t specializes in eating disorders could do more harm than good. Also, do not surprise your loved one with a visit to one of these providers. Please let them know ahead of time. It’s already started, but it’s not too late to sign up!